The stunning panoramic view of the Currituck Sound and Atlantic Ocean is only one reason why you’ll want to climb the Currituck Beach Lighthouse when you come to the Outer Banks. Towering over historic Corolla, the lighthouse has been warning ships since 1875 to keep a safe distance from the chain of barrier islands along the Outer Banks coastline. Today, the historic landmark offers visitors a glimpse into the past, of what life was like along the coast, and how much work it took and continues to take to keep the lighthouse operating. 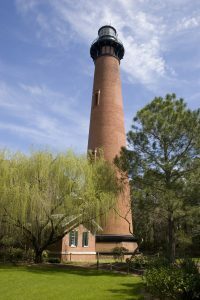 One of the nicest things about the Currituck Beach Lighthouse is that you can climb at your own pace because the lighthouse tour is self-guided. With 220 steps, it takes most people only five or six minutes to reach the top. But if you rush your visit, you’re likely to miss out on some of the lighthouse’s extraordinary features and important history. 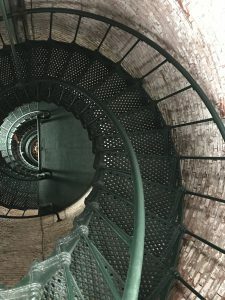 To truly make the most of your visit, Lighthouse Keeper and Site Manager Meghan Agresto recommends taking your time to explore the grounds and climb the tower. 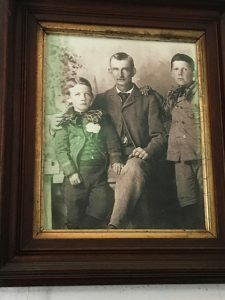 Before you make your ascent, spend some time learning about the lighthouse keepers and their families who lived adjacent to the lighthouse on the grounds. The archives room, at the base of the tower when you enter, features historic photos, correspondence and dishes issued to the various lighthouse keepers. Handwritten letters on display detail some of the troubles the keepers endured — from letting the light go out to engaging in public fighting. On the first, second and third landings, beautiful exhibits showcase the tower’s history, its original construction and subsequent renovation efforts. Here, you can learn how the keepers worked a mechanical system of weights to create a flash of light. Don’t forget to toss in some coins to the nearby wishing well, which was once filled with sand. As you start to climb, look for window displays that indicate which direction you’re facing and how high up you are from the ground. Don’t worry about feeling claustrophobic. There’s ample natural light in the tower. It’s all in the architectural details. On each of the nine metal landings, be sure to look for a little hole that extends into the middle of the tower. This hole was an integral part of the cable and clockwork system that used to descend in order to move part of the lens to create a flash. At the top, look up. After you take in the spectacular 360-degree view at the top of the tower, don’t forget to look up at the Fresnel lens above you. The 143-year-old lens remains an active aid to navigation that turns on at dusk. Ships can see its flash up to 18 nautical miles away. Check out this video for more information about the lighthouse and other nearby attractions at Currituck Heritage Park.